Several kinds of crafting and making are pushing the boundaries of existing copyright law, generating friction between content creators, rights holders, and consumers. Many of the most important battles over intellectual property are pitting established manufacturing industries against individuals and small groups working within the maker movement. In this project, I analyze a case of patents being seized from the Creative Commons by the 3D printing company MakerBot. I begin with a review of literature that covers making, 3D printing, and the Commons/patents. I then present the case and some analysis before explaining important implications for intellectual property and making. Several kinds of crafting and making are pushing the boundaries of existing copyright law, generating friction between content creators, rights holders, and consumers. Many of the most important battles over intellectual property are pitting established manufacturing industries against individuals and small groups working within the maker movement. 3D printing stands at the forefront of the maker movement because this technology is setting the important legal precedents for widespread adoption. In particular, friction between makers and copyright is growing, and this friction is exposing just how broken and outdated US copyright law has become. A copyright law that was written and largely caters to traditional media production is not and will not be compatible with the maker movement. This sentiment has already been affirmed by most of the active makers and services that have committed to an open source model of progress. Services like Thingiverse allow users to publish designs under a Creative Commons ShareAlike, which allows anyone to make alterations to a file or design as long as the derivative is published under a ShareAlike (“About”). The copyleft model allows these technologies to benefit from wide audiences, the exact opposite of traditional manufacture and design processes. Unfortunately, several entities have already attempted to pull designs from the commons and attempt to patent them. For example, MakerBot has already attempted to patent three user-generated designs on Thingiverse. All of the designs were improvements to MakerBot printers, and it is thought the company was attempting to patent them in order to remain competitive in the printing market (Moody). 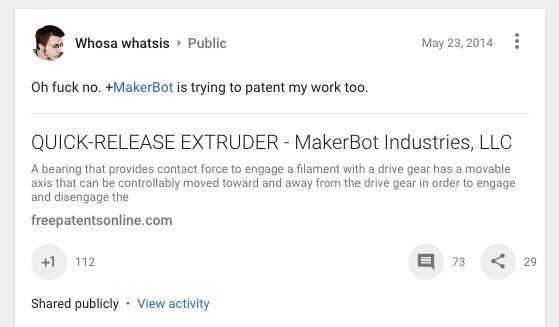 This case is perhaps the most important case of copyright/patent infringement that has yet occurred in the history of Thingiverse, and the eventual outcome will likely impact the future of 3D printing. If these cases are not successfully fought in court, it will establish a clear process of appropriation and no doubt bolster the ability of large companies to seize patents from users. In this essay, I analyze a case of MakerBot pulling work from the Creative Commons and attempting to patent it. I begin with a review of literature that covers making, 3D printing, and the Commons/patents. I then present the case and some analysis before explaining some important implications for intellectual property and making. I chose 3D printing because it is now positioned as the most recognizable technology in the maker movement, but also because perhaps no other technology is as important to the future intellectual property. In “3D Printing: The Future (Or Demise) of Intellectual Property,” John Hornick writes that “IP principles apply to 3D printing just as they apply anywhere else. But 3D printing cuts across all types of IP, all types of technology, and all types of products. Eventually, anyone will be able to recreate an existing product design and manufacture and distribute it, or simply make and use it. Away from control infringement will proliferate and IP will become increasingly irrelevant” (38). These properties of 3D printing and its broad applications make it the best place to begin thinking about the future of intellectual property. passionately with objects in ways that make them more than just consumers. But other influences are in play as well, many of which closely align the maker movement with new technologies and digital tools. Makers at their core are enthusiasts, such as those engaged in the early days of the computer industry in Silicon Valley. We’ve lost sight of that aspect of the computer industry because the devices they create have become so widespread and people no longer need to be enthusiasts to use them. (Daugherty 12). Daugherty’s emphasis on engaging “passionately with objects” is important. Making is often linked explicitly to the early days of Silicon Valley, but its scope has grown past that moment in the history of technology. Makers are still working with some of those practices, like circuit bending, a method of short circuiting consumer electronics, but also adapting those practices to contemporary contexts (Hammer and Knight). Maker methods, partly informed by these historical practices and events, are being applied to other forms like the creation (or making) of music (Walker). In DIY Citizenship: Critical Making and Social Media, Matt Ratto and Megan Boler explain that “[t]his activity is not relegated to the sphere of the digital but also includes communities of self-organized crafters, hackers, artists, designers, scientists, and engineers. These groups are increasingly to be found online exchanging sewing and knitting patters, technical data, layouts, detailed electronics tutorials, and guides to scientific experiments, among other forms of instruction and support” (Ratto and Boler 3-5). Doing-it-yourself has continued to become a popular option for consumers in the wake of the Great Recession. In “Buy-It-Yourself: How DIY Got Consumerized,” Elizabeth Chamberlain explains some of the appeal of the maker movement and some reasons for its renewed popularity. According to Chamberlain consumers have “still not loosened our belts in the slow recovery from the Great Recession, and DIY promises to be cheaper. And that frugality is paired with a Luddite-flavored revitalized interest in handmade things: we shout into the void, ‘We’re not just mindless point-and-click automatons! We can make things, not just buy them!’” (par. 2). Communities like Etsy reflect the dual interest of cost-saving and making, and demonstrate that making is becoming more mainstream. Ratto and Boler contend that the DIY movement and making are no longer confined to weekend hobbyists laboring in their garages. DIY “increasingly constitutes our lived, daily experiences, in particular those that involve media and communication systems. And increasingly, the DIY ethos has seismically reshaped the international political sphere, as can be seen in ongoing global uprisings and the users of multimedia communications” (1). Creating something is often a political act. Though several forms of making involve objects that are often dismissed as apolitical, these activities can “challenge existing systems of authority” and “begin to take on additional importance as dominant institutions, such as the military, corporations, and governments, increasingly recognize the ways in which DIY activities challenge traditional hierarchies of authority and the existing status quo” (Ratto and Boler 5). Making locates authority in the individual and sidesteps the often large barriers to manufacturing. There is an ethical dimension to making when it’s considered as a political act. Many of the methods used by makers are designed to resist existing power structures, and these practices “embody the values inherent in the global justice and Free Software movements and actualize these values in their uptake and use. They belong to the broader tech activist project that is building the digital infrastructure of the global justice movements(s) and, in the process, critically remaking the Internet” (Milberry 63). In “Crafting Change: Practicing Activism in Contemporary Australia,” Tal Fitzpatrick and Katve-Kaisa Kontturi argue that the practice of making things has now become linked to political action. Craftivism “looks to affect real-world change through a movement that combines the principles of social, political, and environmental justice with individual creativity, the act of making by hand, the power of connecting with other like-minded people, and a spirit of kindness, generosity, and joy” (par. 2) Fitzpatrick and Kontturi analyze Knit Your Revolt, a network of crafters based in Australia advocating for asylum seekers and gender equality. The group is composed of crafters that organize via social media in order to take part in demonstrations (par. 6). The groups use crafting to soften the blow of their political activity. The act of crafting works to disarm overtly political action, and they “rely on the idea that small and soft actions can lead to political change” (par. 9). This system has several implications for Benkler and Nissenbaum. They argue that when individuals are allowed to organize themselves, they are liberated from the harsh hierarchies that define traditional labor practices. Freed from these constraints, individuals can practice independence and creativity, and these traits, for Benkler and Nissenbaum, are virtuous — we should strive to create these models and promote virtue (294, 405-408). Maker spaces serve as collaborative sites that are open to all who wish to contribute. They challenge existing oppressive systems and provide a space for all people to create (Toupin “Conclusions”). The most visible facet of the maker movement is 3D printing. These machines have catapulted into public view and enjoy widespread adoption in the manufacturing industry. Though the explosion in press coverage of 3D printers only recently occurred, the technology is not new. In fact, 3D printers were conceptualized by many businesses in the 1970s that were also developing inkjet printing technology. Existing 2D printers were modified to add the extra dimension. Many industries have since used 3D printers for a process called rapid prototyping, which allows a company to quickly test an inexpensive prototype in house before contracting with an outside manufacturing firm (T Rowe Price). These printers were large, very expensive, and often used proprietary data formats to operate, leading to a relatively small scale of adoption in industry. Over the past few years, several brands have attempted to lower costs to a point where hobbyists, small businesses, and entrepreneurs could adopt 3D printers for rapid prototyping and manufacturing. There is now a vast array of entry-level printers available at or slightly below $1000, like the Makerbot Mini. The models scale up in size, capability, and complexity depending on the needs of a consumer. For the average consumer, educator, or hobbyist, 3D printing is still a niche market with limited real-world applicability. Most printers available to the general public are small in size and can print using plastic filaments while advanced models can print using multiple materials including metal (“Prox”). Any user familiar with CAD can create a design using sketching software that can interface with a printer. Objects can also be scanned using a 3D scanner that can be purchased from many of the same companies manufacturing printers. The average consumer can also access a wide range of potentially useful designs through resources like Thingiverse, an online bank of print designs. Many, if not most, of these designs are small models of household items, toys, or replacement parts for larger appliances or electronics. While printing plates and utensils has some appeal, consumers so far have not rushed to purchase 3D printers on a truly massive scale. These applications, though, fit into the vision that many have for 3D printing. The potential to, say, print a few extra plates when unexpected guests arrive would be convenient, and these potential applications are attractive to the manufacturing industry. With 3D printing, it will eventually be possible for a consumer to shop in a physical store to browse for products, then make alterations to that product via computer terminal before finally ordering a customized version of that in-store product. The product would then be printed off-site at a regional manufacturing plant before being shipped direct to the customer. No global transport, no warehousing, no waste material. This model would allow a customer choice of color, shape, and specific dimensions (imagine adjusting the length of a potential dining room table based on the size of a dining room) without dramatically increasing cost (Harouni “Primer”). 3D printing is also being used to create organs suitable for transplant and to treat burn victims by printing a skin-like substance. (Atala “Printing”). Information about patents, copyright, and the Creative Commons are becoming increasingly muddled and difficult to tease out, so I want to spend a moment explaining some definitions and the contrasts between groups. The biggest lobby and source of writing about collaborative intellectual property is the Creative Commons. The Commons was created in 2001 with the intent of providing legal and technological infrastructure for people to share things on the Internet (“State” 1). It’s already clear that the Internet presents significant challenges to traditional definitions of intellectual property, and the Creative Commons represents perhaps the frontline of protecting user interaction and the free sharing of ideas in digital spaces. User interaction and use of the Creative Commons has been increasing significantly. In 2015, the number of works licensed in the Commons surpassed one billion, and size of the Commons has roughly doubled in the same time (“State” 2-5). Commons content is also remarkably diverse. It houses research, images, video, audio, and a wide variety of other documents (“State” 7-8). Information can be published into the commons using a variety of Creative Commons licenses. The licenses themselves are multi-layered. First, they act as legal code meant to be a kind of tool. Secondly, that tool is translated into a format readable by individuals without specific legal training. The final layer is technological, a “machine readable” format that computers and software can easily understand (“Three” par. 1-3). There are six licenses currently available for use. There is a significant variety between the licenses in terms of openness and user freedom. The most open, for instance, is an Attribution license, which allows anyone to remix, build upon, sell, or distribute as long as the original author is mentioned. At the other end of the spectrum is the Attribution-NonCommercial-NoDerivs, which restricts users to simply downloading and using work. This license does not allow tweaking, building upon, or selling (“The Licenses” par. 1-6). The goal is to allow individuals to publish content on their own terms, and then to allow for that content to be used by others while still maintaining some rights for the original content owner. Patents are distinct from the Creative Commons. According to the US Patent and Trademark Office (USPTO), a patent is “the grant of a property right to the inventor, issued by the United States Patent and Trademark Office,” and a patent generally excludes other individuals or groups from making and selling the object, process, or plant that has been patented” (“What are” par. 2-3). There are three types of patents issued by the USPTO. The first is for a process, such as a new way to manufacture an existing substance. The second is for a product (the kind of patents I will be discussing in this manuscript). The final is for a plant formed through asexual reproduction. Once issued, patents allow for courts to enforce claims made about the origins of processes, devices, and plants. (“What are” par. 4-5). Individuals can only be granted a patent from a patent office, as opposed to a CC license, which can be self-determined. If a particular user is not generally interested in profiting from a design or invention, and is more interested in sharing that design, a CC license is the favorable choice. Patents cost money and can take time to file whereas a CC license can be chosen quickly for no cost. The case study presented below involves a complicated instance in which material protected under a CC license was patented by a company without regard for the initial CC license. In fact, the sheer amount of money to be made from the propertizing of software methods and techniques has created what is commonly referred to derogatorily as the patent troll. Rhetorically constructed as parasitic rather than inventive, the patent troll is condemned for failing to remix its labor either in the discovery of ideas or the use of ‘its’ invention. For the patent troll owns ideas, but not ideas generated from its own labor and need of use. Instead the patent troll thrives by first buying up patens, second searching for those who might be practicing any of the inventions in its patent portfolio, and third collecting monetary compensation for that infringement (Maher 126). Smartphone manufacturing firms are increasingly resorting to these trolling tactics in order to sabotage competitors, but smaller firms are using these tactics as well. There are other dimensions and ideologies wrapped up in the Commons — it isn’t solely a repository for ideas. Jennifer Maher highlights the moral and ethical dimensions of open source software in Software Evangelism and the Rhetoric of Morality. She explains the genesis of the open software movement involved a moral and ethical decision to produce quality software and distribute it widely (4-8). Depending on who is doing the arguing, these dimensions of the Commons are often ignored, and ignoring those relationships is often strategic. Maher contends that “we can see in this asynchronous exchange the possibility that the law serves as an apparatus of moral good, even competing notions of moral good, even while appearing neutral to such concerns” (119). These relationships still exist even when entities ignore them, and these ethical/moral dimensions are important when considering how individuals and entities should interact with the Commons. My case involves the seizure of user-generated designs from several online making communities. By using CAD (computer assisted design) software, users can create designs for virtually any kind of product they like and transfer that data to a 3D printer for fabrication. Many users choose to publish their designs to online repositories like Thingiverse. These designs are copyrighted and often published using Creative Commons License. This case specifically involves the taking and patenting of several designs from the Commons by a large company that manufactures 3D printers called MakerBot. Before continuing, a caveat on the timeline of this case study. The beginning of MakerBot’s attempts at patent seizure is not totally clear, nor is the full scope of instances in which MakerBot (or other ostensibly maker-friendly companies) have seized content from the Commons. This is true mostly due to a kind of typical interaction cycle between makers and what they make. As 3D printers have decreased in cost, their adoption has increased and resulted in a proliferation of low-cost printers landing in the homes of hobbyists. These printers are often only able to make smaller, uncomplicated objects for personal use (as opposed to the more complex printers used in industrial applications). A user may then, for example, design and print an idea for a spoon. The spoon is novel, the maker is pleased, and the design is published to a web site under a creative Commons license. I suspect many of these designs are forgotten even by their creators. After all, this is the very nature of experimental play. The value is in the process, the kind of meta-thinking the process required, not necessarily in the finished product. The spoon may not have been valuable to the individual maker, but what if an Ikea engineer stumbles across the design and suddenly finds himself in possession of the next must-have silverware collection? What if it is only years later that the original maker discovers that Ikea has made a significant amount of money using her spoon? This scenario is complicated by time and frequency. The 3D printers now on the market operate with relative ease and allow makers to create a great deal of things in a short time period. Many of these designs are then sent to a repository such as Thingiverse and are subsequently available for free under a Creative Commons license. Many are simply forgotten. This case study presents an outline of attempts by a company to patent designs published under a creative commons license. The outline is not complete because the extent of this problem is not yet known, but what is known is sufficient for an analysis and discussion. The first writing about MakerBot’s patent practices occurred in October of 2013. Michael Molich, writing for 3D Printing Industries, identified a large and increasing desire for a so-called automated build platform (ABP), which is a conveyor belt used to advanced completed prints off a print platform. According to Molich, “the biggest issue with creating a conveyor belt for your 3D printer is that, once you’ve done it, you can’t sell it because Makerbot has already filed patents for their original automated build platform, released in the good ol’ days…back before britches were too big and bedfellows were too strange. And because they’ve covered both the device itself and the process that it performs, it’d be pretty hard to legally sell your own” (par. 2). Molich’s tone here is a bit sheepish, and he avoids directly implicating MakerBot, but he does mention the company explicitly later in the article when he reproduces a quote from the inventor of the first ABP which I will reproduce here as the language is important: “I’d like to clarify a point on patents. I made the ABP long before I worked at MakerBot and with no expectation of profiting from a patent. Patents stifle innovation and harm those who would otherwise benefit from products suppressed by the patent system” (Pax qtd. in Molich par. 6). Chris Pax, the original inventor of the ABP, apparently brought his patent to MakerBot. Though Molich stays neutral, Pax’s observations on patent law appear to contradict his own actions. Regardless of intent, MakerBot is linked to some (perhaps) questionable acquisition of patents. Though perhaps not widespread initially, MakerBot’s actions continued to gain some media coverage. This coverage, however, did not deter MakerBot from attempting to seize more work from the commons. The explicit instances of MakerBot patent seizure continue in 2014. In a blog post titled “Stay Classy, Makerbot,” fabrication company OpenBeam claims that MakerBot panteted designs for an automatic print head leveling technology after several companies and individuals had already demonstrated working designs of the tech. OpenBeam had even sent a working evaluation model to Make Magazine for review. According to OpenBeam, “it’s not a stretch to imagine Makerbot coming after other open source 3D manufacturers that threaten their sales. After all, nobody acquires a patent warchest just to invite their competitors to sit around the campfire to sing Kumbaya. It is therefore vitally important that community developed improvements do not fall under Makerbot’s (or any other company’s) patent portfolio to be used at a later date to clobber the little guys” (emphasis in original par. 6). The “little guys” mentioned here are 2 other individuals who had already confirmed working versions of this technology via social media. OpenBeam has since filed a 3rd party prior submission form with the US Patent and Trade Office in order to challenge MakerBot’s patent (“Stay Classy”). MakerBot’s response as of this moment has not included any pledges to restore any of the designs it has patented to the Commons. Instead, they do express desire to continue working with the community and to continue evaluating the ways in which they use intellectual property. Also, no legal challenges have surfaced to MakerBot’s activities, leaving the situation precarious. Copyright theft is not limited to MakerBot, and there have been several other prominent case studies recently that demonstrate the fragility of user copyright and choices about content. In the winter of 2014, several users of the photo service Flickr noticed that photographs they had made available under Creative Commons licenses were made available for sale on the website. It was clear that Yahoo, the owner of Flickr, was attempted to profit from these photos, despite claims otherwise (Nieva par. 1-3). This case is particularly nefarious due to Flickr’s ostensible support of the commons (the service allows users to explicitly select a creative commons license so that the photos can be used royalty free). Yahoo appears to have underestimated the involvement of their users in the service, and found themselves fighting back against a significant wave of criticism. If this example makes anything clear, it should be a pattern by some companies to push against the commons, then hurriedly backpedal when appropriate. This was the exact tactic used by MakerBot. There is an initial presumption of edgy innovation only to follow astonishment that the Creative Commons exist and that people enjoy maintaining copyright over their work. The statement concludes: “Subsequently, we’ll work closely with Creative Commons to come back with programs that align better with our community values” (Hernandez par. 5). This is perhaps the most shocking element of the response, the presumption that Flickr needs special provisions in this scheme. MakerBot’s official response to the community after their patent practices came to light was, at moments, antagonistic toward to making community at large. Bre Pettis’ blog post on the subject even goes as far as to suggest that “some members of the community need to be taken to task. The hearsay, rumor creating, physical threats, and lack of respectful dialogue have been disappointing. If this is how the community treats a company that has shared a lot, it will be harder for other businesses and projects to choose open source as a way of sharing their work (par. 14). There is even an implied threat here that MakerBot may refuse to work with individuals in the future based on these arguments surrounding their use of intellectual property. This is one reason I find the MakerBot case compelling and worthy of analysis. We are seeing the tension between the open source nature of the maker movement and traditional corporatism play out. As makers capitalize on their goods, there’s a clear distinction that arises between them and others who do not work solely for financial gain. The tensions that arise from these distinctions will never disappear, but it is important that we understand them, if only to better understand the economic and social dynamics of making and craft rhetorics. This may be a feature of the status of making as countercultural production. Its products may remain particularly susceptible to appropriation by dominant cultural forces. While consumers in the post 2008 economy are frequently turning to DIY methods to create and acquire, companies are appropriating the things that are made. We are likely seeing some form of a repeat from companies that appropriated symbols of youth counter culture in post-war Europe. DIY is cool, and is being commercialized in a way that stands in stark contrast to the principles of the movement. In “The Maker’s Contradiction,” Carelli, Bianchini, and Arquilla argue that making drives consumption rather than stemming it (11, 17). The shift from making to consuming is exactly what many makers are seeking to avoid. This may be the fate of any movement that seeks to get involved with manufacture, but one thing is clear: makers are fueling traditional economic structures. They may also be resisting those structures simultaneously, but the MakerBot case illustrates that many companies are not interested in considering the ideological dimensions of the maker movement. New avenues of democratic participation and citizenship are also in question. Ratto and Boler define making as a component of participatory culture, one that stands to diversify voices and strengthen democracy in the digital age. The MakerBot case illustrates the precariousness of these claims. I suggest that citizenship loses much of its power when the products of citizenship can be easily seized by larger, powerful entities. The creations of private individuals were so easily seized by MakerBot that I have a hard time viewing those creations as protecting democratic principles rather than serving corporate interests. We have already seen the emergence of the digital corporate citizen, and we are now seeing just how dangerous those citizens can be. Similarly, activism through craft and making may be dangerous to those participating. Though Fitzpatrick and Kontturi show the value of craftivism, their work does not present circumstances like the case of MakerBot seizing content from the commons. The impact of such activism may be significantly hampered by corporate interests seeking to acquire the objects that are made or coopt the message of making. Finally, making may not be generating new economic models. In Benkler and Nissenbaum’s view, Commons Based Peer Production is liberatory and ethically just, but I think those conclusions simply cannot be drawn when Commons Based Peer Production is so vulnerable to appropriation. The most frustrating aspect of the MakerBot case for me was how easy it was for MakerBot. They didn’t have to invent anything, derive any new process or product. They simply had to pick what they wanted and file some paperwork. Encouraging Commons Based Peer Production and assuming its value without advocating for makers is disingenuous at best. At this point, the new economic models presented by Benkler and Nissenbaum may function closer to the relationships pointed out by Carelli, Bianchini, and Arquilla in “The Maker’s Contradiction.” Makers may only be serving corporate interests when they publish content. One area where I think these impacts could be felt hardest is higher education. Many schools are opening 3D printing to students. In “Implementing a 3D Printing Service in an Academic Library,” Steven Pryor documents the process of creating a 3D printing station in a campus library. He notes that contemporary “[l]ibraries provide resources for not only consuming information, but also for generating new information and research. In addition to books and academic journals, we traditionally provide creation tools such as computers, 2D printers, and copy machines. Sometimes the product of one’s research may be a physical artifact such as a sculpture, a structural design, a prototype device, or a biological model (par. 6). Any of these projects would excite a researcher. After all, these are exciting possibilities. What isn’t clear are the protections (or lack of protections) over work generated by these resources. The next phase of controversy will likely involve tensions between the intellectual property rights of professors, researchers, institutions, and student bodies. Web technologies continue to pose problems for legal definitions of intellectual property. In fact, most of our practices on the web confound the ways that IP has traditionally flowed in public spaces. In Cyberliteracy: Navigating the Internet with Awareness, Laura Gurak argues that new technologies “have created a confusing and challenging time for copyright policy. Standard practices in cyberspace — resending email messages; blending visual, textual, and audio material on Web pages; and copying and pasting information from a variety of sources — are often in violation of current copyright law” (122). Pursuing action against someone for re-sending an email wouldn’t fly in a courtroom, but little has been done to address problems in intellectual property law, and the amount of complications increases when we consider certain technologies like 3D printers. This observation cuts across all intellectual property debates. Fueled by makers, the Commons is exploding in size. In a figure cited earlier, the Commons roughly doubled in size in 2015. This proliferation of intellectual property does not mesh well with traditional legal and cultural definitions of copyright. It is clear that certain kinds of intellectual property do not have uniform value. In the 3D printing cases I cite, there is a very clear kind of cherry picking perpetrated by MakerBot. Only patents directly relevant to their success as a business are deemed important and worthy of theft, but what about a simple trinket designed by an anonymous individual? What is the value of such a creation? What if ownership cannot be determined? I think questions like these need to be posed, and will govern the future of how we envision intellectual property and ownership. Cases of anonymous creation of objects and their usage by others will likely form the core of copyright laws. The vast proliferation of the Commons, paradoxically, does not equate with increased access to information. Conversely, the MakerBot case illustrates that free information still has a price, and a price-point that is attractive to some companies, attractive enough to pull content from the Commons into a patent war chest. Gurak explains that the “Internet promotes open information, and faire use doctrine states that under certain conditions, it is not necessary to obtain permission. But all around us, through increasingly restrictive legislation and harshly worded licensing statements, we are being told that it’s not OK to share. Even a concept so fundamental to the Web as the idea of linking to another Web site has come under the scrutiny of copyright law” (125). So we arrive at a two-tiered Internet. One level exists for ostensibly everyone. We can envision that Commons also exists in this tier, the free Internet. The other tier exists above the free Internet and is filled with corporate actors that can cherry pick profitable IP from the free Internet with no repercussions. Laura Gurak identifies the risk in this relationship between content holders: “If this trend toward mega-mergers continues, students, educators, artists, and even these large media companies will find a vastly decreased amount of public-domain material from which they can draw, and in the end we will be sorely limited in our ability to use the vast amount of information that is available in electronic spaces” (124). Benkler and Nissenbaum arrive at a similar conclusion and caution that “[d]espite the positive potential of commons-based peer production, there is cause for concern over its future flourishing. The primary sources of resistance are rent-seeking behavior by incumbent firms of the industrial information economy and well-meaning, but ill-informed policies and judicial decisions” (401). The result of this behavior from traditional market forces will be a smaller Commons, certainly a Commons with less value and security. There are several ways to approach strengthening individual rights to IP on the Internet. I will propose two here: 1) increased governmental involvement, 2) increased personal vigilance. These are only two possibilities out of many that are being pursued within governments and NGOs. I do not mean for these possibilities to be exhaustive. Rather, the research presented in this article dovetails into these two solutions. The government has an interest in protecting the commons, and, by extension, makers. In their article “Hackerspaces and Meta- Creativity,” David Seckinger, Brett Park, and David Gerhard explain that governments and NGOs are beginning to realize that makers and makerspaces fit into the public by creating and disseminating knowledge (4). These actions should be central to any democracy. In “The Comedy of the Commons,” Carol Rose explains the two-pronged legal justification for a public to claim property using the government: “first, the property had to be physically capable of monopolization by private persons — or would have been without doctrines securing public access against such threats. Second, the public’s claim had to be superior to that other private owner, because the properties themselves were most valuable when used by indefinite and unlimited numbers of persons — by the public at large” (Rose 774). These two criteria have traditionally been applied to natural spaces like beaches. Companies in some jurisdictions are allowed to monopolize access, but some areas have claimed beaches as a public good using the two-pronged test laid out above. Rose’s solution to the question of public property is to “equate the ‘public’ with government. This form of public property, wherein a corporately organized body could claim exclusive control over the property — investing in fit, managing it, exchanging it — just as a private owner would; such a solution would obviate the ‘commons’ problems thought to accompany nonexclusive use” (730). This might be the quickest and easiest way to protect IP. Though often heralded for their potential to impact so many industries, 3D printers have not entered the mainstream without significant controversy. 3D printers are now being used to create weapons and parts of weapons, like sound suppressors, that are currently in violation of federal law. Many of these designs are going into the commons via CC licenses. Cody R. Wilson, head of the 3D printing startup Defense Distributed, has printed the lower receiver for an AR-15 weapons platform (the same rifle used in the Sandy Hook mass shooting). The lower receiver of the rifle is, in essence, the weapon. All other components, such as the barrel, stock, and magazine, detach and can all be purchased online with no background checks or registration required. Wilson was able to replicate the lower receiver, attach the missing parts, and fire the weapon successfully (“Click.Print.Gun”). The heart of this controversy lies in the ability of an individual to manufacture a weapon. Previously, no regulations existed on the creation of firearms by an individual, but this case challenges policy due to the speed and ease of printing a weapon. Upon completing the part, Wilson uploaded the CAD file to Thingiverse, where it was successfully hosted until the company abruptly shifted stance on weapons. In response, Wilson created DEFCAD, a hub for members of the wiki weapon movement (“Click.Print.Gun”). Perhaps no other use of a 3D printer is as controversial as the ability of an individual to fabricate weapons with no oversight. What does this mean for the future of a commons? Should the commons contain information or intellectual property that isn’t necessarily there in the public’s best interest? I can envision a mass shooting in which an individual printed the receiver of an AR weapon and used it to commit a crime. In this instance, the commons may become a liability and stand in opposition to the greater good. The need for governmental regulation may stand at odds with traditional conceptions of how Internet technologies work. In Persuasion and Privacy in Cyberspace, Laura Gurak notes “[m]any individuals on the Internet, especially those concerned with privacy and free speech, have traditionally held a kind of libertarian viewpoint emphasizing self-governance of information. As is obvious from their distrust of Big Brother, these individuals are against most forms of gatekeeping in cyberspace and instead rely on what they see as the self-regulating mechanism” (84). When digital communities fail, it may necessitate governmental involvement, despite being unpopular. Ultimately, regulation may help to protect individuals on the Internet and their intellectual property, even if that kind of involvement from the government isn’t viewed as favorable. If internet technologies continue to be designed to operate under a libertarian framework (there isn’t any reason to assume they won’t, barring governmental intervention), then individuals creating IP need to become more vigilant and take an active role in securing their IP. Benkler and Nissenbaum argue that one way to combat such intrusions from outside actors is to ensure that projects “include an established, low-cost way of defending itself against both incompetent and malicious contributions. Given that peer production is dependent on self-identification of people for projects, each community must have a way of weeding out contributions from those who misidentify their talents” (401). The authors do not provide specific ways in which this can be achieved, but I think their emphasis on the communal is appropriate. Each group at work may choose to rely on an individual system of content protection. As illustrated in the case study, prior art through a collective text such as a blog may be necessary to protect the content rights of individuals involved in the maker movement. The need for protection against large firms also stems from the relationship between making and money. Benkler and Nissenbaum explain that most “peer-production enterprises are non-price based, that is, they are devoid of marginal payments to contributors for contributions…People contribute for a variety of reasons, ranging from the pure pleasure of creation, to a particular sense of purpose, through to the companionship and social relations that grow around a common enterprise (402-403). Increased access allows for more individuals to participate and create, and many of these individuals may be participating for compensation that isn’t monetary. One thing we can learn from the MakerBot case is that patents should no longer involve one individual laboring intently in a garage to create something new, then quietly filing a patent on the innovation. MakerBot seized designs that were published under Creative Commons licenses, but the overall resistance was decidedly toothless. The Commons license did remarkably little in this scenario. The lack of pitchforks illustrates the contemporary problem within our understanding of intellectual property as it relates to invention, the dissemination of invention, and ownership. The kind of patent appropriation described in the MakerBot controversy stems from a problem of writing. Earlier in this piece, I cited an OpenBeam blog post detailing their discovery of an abducted patent. At the end of their post, the group advocates for thorough documentation, but not just documentation of the engineering: “This goes on to illustrate the importance of sharing and publishing your work with the community, so that when needed, we can establish an online trail of prior art” (“Stay Classy”). Prior art, as it is mentioned here, is a process through which an individual can submit proof to the United States Patent Trade Office that indicates a patent is illegitimate due to prior existence. The process involves sending proof of prior art through stable resources (uspto.gov). Web sources can shift rapidly, and hard copy files appear to be preferable in arbitration (though this process is labyrinthine and complex, open to much ambiguity). OpenBeam admits this is not something they have worked hard enough to do, and I’m sure they aren’t the only group that has failed to sufficiently document prior art. In fact, most hobbyists in the maker movement likely fail to do so. This case study itself was daunting to track down, and I did so mostly through picking up threads of this conversation from a variety of venues, finally locating documented instances of patent abduction. The issues at stake, the rights of makers vs. corporations, should mean clear, cogent documentation. The digital nature of these processes, though, often means that content is handed off to third parties, published on a blog (with unknown duration), or even mentioned in passing on Twitter or Google+. Ephemera certainly can’t help to demonstrate prior art. The process of legally establishing intellectual property now requires more than a clear explanation of design and concept, but should also require documentation of all aspects of the creative work from its inception to execution. The danger for a content creator involves the scope of the idea and perceived value. A lone maker can design and fabricate a variety of tools or devices and can also publish those designs to the commons with the intention of helping others. Problems arise when, as in the MakerBot case, a company perceives substantial value in a design that may already be in the commons. Seizing and subsequently patenting the design is easy enough for a large company with an intellectual property infrastructure. The only viable means for an individual or small group of content creators may be demonstrating prior art by engaging a variety of venues to document invention. Prior art may not be the panacea needed to protect content published under creative commons licenses. In fact, there may be no easy solution for these problems. Patent law reform is a decidedly unattractive policy platform in the contemporary political landscape. Those individuals and institutions (like university campuses) caught up in the furor of the maker movement may be prone to ignoring issues discussed by Moody. Prior art may seem like a solution, but it doesn’t mean much in the overall matrix of copyright if makers aren’t receiving strong protections, or at least statements of good will from larger companies. I think many of us would expect an open commitment to protecting intellectual property from these companies, especially (as Moody notes) their beginnings as open-access entities. This may not be the case. Emerging technologies will continue to challenge broken copyright laws. The case of MakerBot’s patent theft presented here is one of many contemporary cases that test of the validity of copyright in the moment of making, a time when the amount of content entering the commons is dramatically increasingly. The very notion of the Commons as a legal entity is called into question when groups and corporations refuse to acknowledge its validity. My hope is that this work begins a conversation about the future of intellectual property in the digital age. If anything, this case illustrates that the time for these conversations is now, and that traditional notions about copyright are already outdated. Atala, Anthony. “Printing a Human Kidney.” TED.com. TED Conferences, LLC, 2011. Web. Benkler, Yochai, and Helen Nissenbaum. “Commons-Based Peer Production and Virtue.” The Journal of Political Philosophy 14.4 (2006): 394-419. Print. Carelli, Alessandro, Massimo Bianchini, and Venanzio Arquilla. “The ‘Makers Contradiction:’ The Shift from a Counterculture-Driven DIY Production to a New Form of DIY Consumption.” A Matter of Design: Making Society Through Science and Technology. Milan: N.p., 2014. 12-14. Print. Chamberlain, Elizabeth. “Buy-It-Yourself: How DIY Got Consumerized.” Harlot: A Revealing Look at the Arts of Persuasion 1.14 (2015): n. pag. Web. Creative Commons. “About The Licenses — Creative Commons.” N.p., n.d. Web. 29 July 2014. — . “State of the Commons.” State of the Commons. N.p., n.d. Web. Davies, Alex. “Makerbot Blatantly Steals and Patents a Community Design.” indistinguishable from science. 23 May 2014. Blog Post. Dougherty, Dale. “The Maker Movement.” Innovations: Technology, Governance, Globalization 7.3 (2012): 11-14. Print. Fitzpatrick, Tal, and Katve-Kaisa Kontturi. “Crafting Change: Practicing Activism in Contemporary Australia.” Harlot: A Revealing Look at the Arts of Persuasion 1.14 (2015): n. pag. Web. Gurak, Laura J. Cyberliteracy: Navigating the Internet with Awareness. Yale University Press, 2003. Print. — . Persuasion and Privacy in Cyberspace: The Online Protests over Lotus MarketPlace and the Clipper Chip. New Haven: Yale University Press, 1997. Print. Hammer, Steven, and Aimée Knight. “Crafting Malfunction: Rhetoric and Circuit-Bending.” Harlot: A Revealing Look at the Arts of Persuasion 1.14 (2015): n. pag. Web. Harouni, Lisa. “A Primer on 3D Printing.” TED.com. TED Conferences, LLC, 2011. Web. Hornick, John F. “3D Printing and the Future (or Demise) of Intellectual Property.” 3D Printing and Additive Manufacturing 1.1 (2014): 34-43. Web. Kurman, Melba. “Carrots, Not Sticks: Rethinking Enforcement of Intellectual Property Rights for 3D-Printed Manufacturing.” 3D Printing and Additive Manufacturing 1.1 (2014): 44-51. Web. Maher, Jennifer Helene. Software Evangelism and the Rhetoric of Morality: Coding Justice in a Digital Democracy. New York: Routledge, Taylor & Francis Group, 2016. Print. MakerBot. “MakerBot | 3D Printers | 3D Printing.” MakerBot. Web. — . “Replicator 2 Extruder Alternative: Some Spring In Your Step.” MakerBot. 22 Feb. 2013. Web. Molitch-Hou, Michael. “Open Source Automated Build Platform Turns 3D Printer into 3D Factory.” 3D Printing Industry. 30 Oct. 2013. Web. Moody, Glyn. “MakerBot Files For Patent On A Design Derived From Work By Its Community | Techdirt.” Techdirt. 28 May 2014. Web. Musil, Stephen. “Flickr Ends Sale of Prints Uploaded under Creative Commons.” CNET. 18 December 2014. Web. OpenBeam. “Stay Classy, Makerbot.” OpenBeam USA. 23 May 2014. Web. Pettis, Bre. “Let’s Try That Again.” MakerBot. 24 September 2012. Web. Pryor, Steven. “Implementing a 3D Printing Service in an Academic Library.” Journal of Library Administration 54.1 (2014): 1-10. Web. Ratto, Matt, and Megan Boler. DIY Citizenship: Critical Making and Social Media. Cambridge Massachusetts: The MIT Press, 2014. Print. Ratto, Matt, and Robert Ree. “Materializing Information: 3D Printing and Social Change.” First Monday 17.7 (2012): n. pag. Web. Reuscher, Jason A. “Three-Dimensional (3-D) Scanning Within Academic Libraries: Exploring and Considering a New Public Service.” Pennsylvania Libraries: Research & Practice 2.1 (2014): 64-70. Web. Rose, Carol. “The Comedy of the Commons: Commerce, Custom, and Inherently Public Property.” The University of Chicago Law Review 53.3 (1986): 711-781. Print. Seckinger, Nathan, Brett Park, and David Gerhard. “Hackerpsaces and Meta-Creativity: A Response to ‘Moving Saskatchewan’s Creative Industries Forward — Building a Long-Term Strategy’.” 2013: n. pag. Print. Masnick, Mike. “The Future Of Music Business Models (And Those Who Are Already There) | Techdirt.” Techdirt. 25 Jan. 2010. Web. T Rowe Price. “A Brief History of 3-D Printing.” Web. Toupin, Sophie. “Feminist Hackerspaces: The Synthesis of Feminist and Hacker Cultures.” The Journal of Peer Production 5 (2014): n. pag. Web. United States Patent and Trademark Office. “General Information Concerning Patents.” 2015: n. pag. Web. Vice Motherboard. “Click, Print, Gun: The Inside Story of the 3D-Printed Gun Movement.” Vice.com. N.p., n.d. Web. Walker, Joyce Reenste. “Crafting a Music Community: Making Music and Musicians in Concert.” Harlot: A Revealing Look at the Arts of Persuasion 1.14 (2015): n. pag. Web. Chet Breaux directs the Digital Writing Studio at Florida International University. He studies new media and the maker movement and is particularly interested in the evolving content creation practices of individuals and the role that these practices play in the manufacturing landscape.